Don’t Dump Rabbits is affiliated with the not-for-profit Las Vegas Chapter of the House Rabbit Society with the goal of helping abandoned domestic rabbits everywhere. You may have just come upon a situation where a colony of abandoned domestic rabbits are living in dire circumstances or know of a place where rabbits have been abandoned for many years. It can be overwhelming to know how to begin to help the rabbits. To get a quick start learning about “Community Rabbits”, please read the following article. 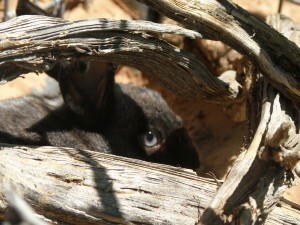 You will find additional information within the dontdumprabbits.org website. The site will be kept active with information on how to help abandoned rabbits through resources, news, books, galleries, media, rabbit care and more. For individual questions or assistance use the “contact us” links. Thank you for helping the rabbits. This entry was posted in About by bekind. Bookmark the permalink. Wonderful website. I hope it opens awareness .well done !